It’s been a long time – I KNOW. I moved back to Seattle, summer came and went in a flash, then Scott and I bought a house and we moved. It’s been crazy. And all this and harvest season arrived!! 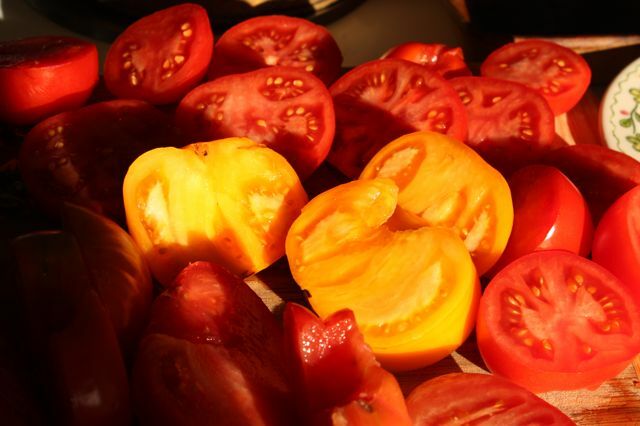 As usual, the Seattle tomato season brought a few big gorgeous fruits and many many small ones. 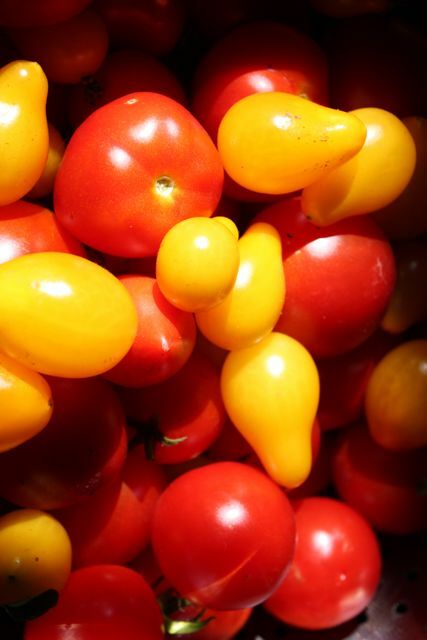 As usual, the tomatoes I canned were not my own but were brought in from the much warmer clime of eastern Washington. Left with dozens upon dozens of cherry tomatoes (Yellow Pear, Fox), walnut-sized tomatoes (Roma, Stupice), and, OK, a handful or two of gorgeous heirloom brandywine and Orange Queen, what to do? I began of course by making fresh tomato sauce pasta dinners. Yum. But I began drawing fruit flies and we began getting a wee bit tired of the same-old same-old. I’d read in Barbara Kingsolver’s book ‘Animal, Vegetable, Miracle’ that she dries, roasts, and freezes. 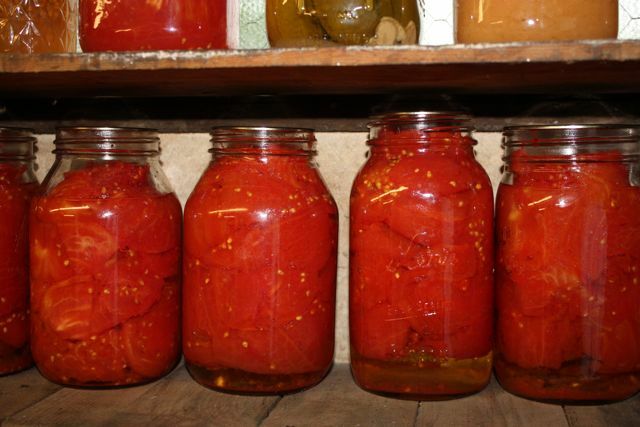 I’d been curious about a preservation method that was different than canning, and possibly easier. 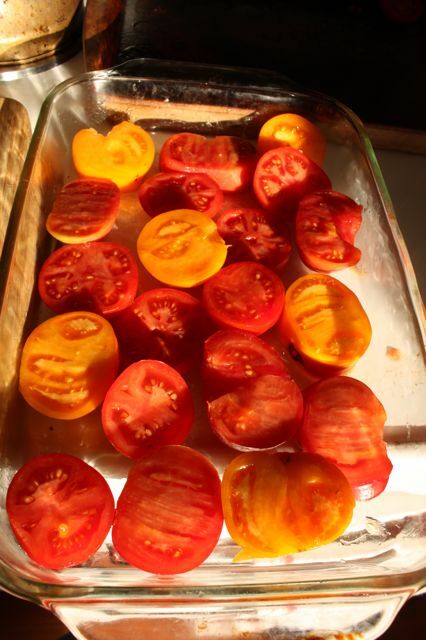 I neglected to take photos of my first attempt in which I ‘roasted’ the tomatoes for 3h at 400F. Don’t do this. They became tragic and comical airy dry, black pucks. I hesitantly popped in my mouth the few slices not too black to recognize as tomato, and they showed the promise and hour or so less oven time would have given. So the pucks went out to the compost, I spent 40 min scraping the charcoal off the roasting pan, and I tried again. Success! 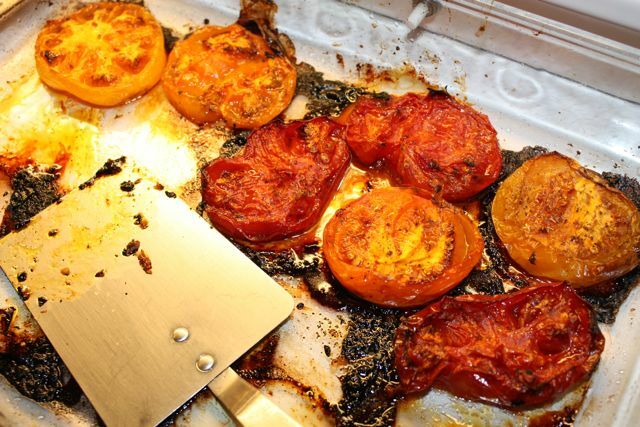 There is no ultimate recipe for roasting tomatoes. It’s a trick of time and temperature. Cut in half around the equator (in thirds if they are full-sized), lightly coat in oil, place cut face up in a dish, and cook them at 400F for 1h or 300F for 2h or 250F for 3h – just keep checking. Larger tomatoes need more time than cherries, but even crispy cherries are moan-eliciting yummy and I have a hard time not just eating them all off the pan. The first night we made pasta with them, bit of oil, goat cheese, cracked pepper, fresh basil and oregano – WOW! 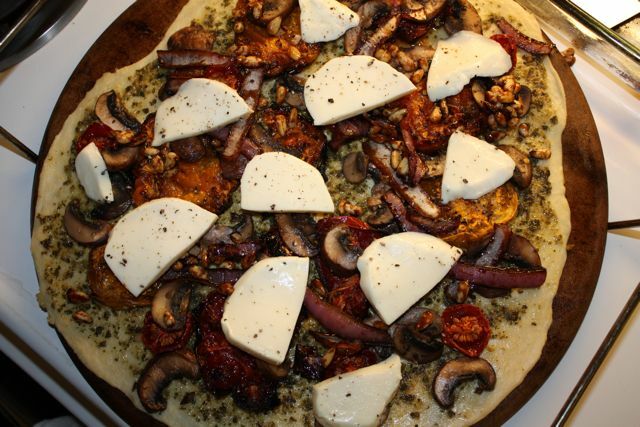 Last night we put them on a homemade St.Louis style pizza with pesto sauce, caramelized red onion and pine nut, sauteed mushrooms, and mozzarella. The tomatoes are unbelievably good. I stuck the leftovers in the fridge in a glass jar, one covered with oil, one not. If you’ve any tomatoes at home, try this. You won’t regret it. 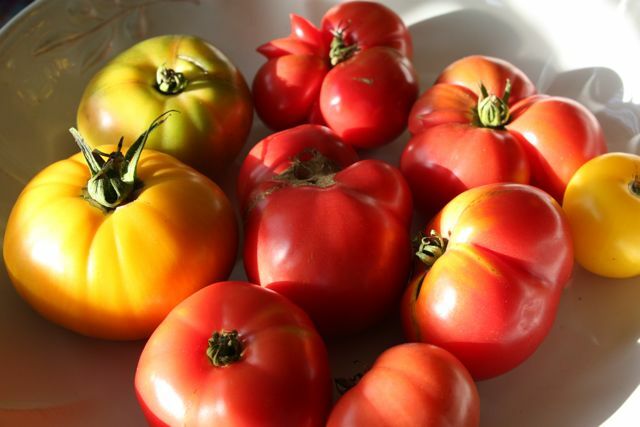 This entry was posted in Canning, cooking, Food preservation, Heirloom, tomatoes. Bookmark the permalink.